I've Become a Sloth OR Who Are These Motivated People?! It is true. 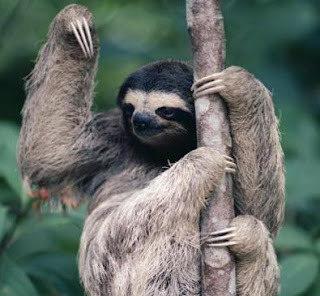 I've become a sloth without a tree. But I have a couch. That is where you will find me. Snuggling my toddler. Directing homework. It takes great effort to walk across the room, even for dinner. Some nights, I have a glass of dry red. Some nights, I have cool ice water. They are interchangeable. Who are these motivated people I read about on Facebook? The ones mowing the lawn, trimming bushes, cleaning their house. You know who you are. Where does the energy come from? I've decided I must begin to work out again. I invested in a three-workout personal-training-led deal from Groupon and I start Wednesday. It starts with a fitness evaluation. I really am not looking forward to those results. I am thinking that if I move around, I will get motivated. I will find something more active to do rather than the current lay-on-the-couch activity. Call it a funk. A slump. Whatever. I just know it needs to be over relatively soon and hopeful the working out will be the motivator.